Last week I was just reading the success stories of several entrepreneurs worldwide. While some showcased the journey from racks to riches, there were some others who simply lead their entire life with just one focus which was to take their Mom and Pop business to the next level. While there wasn’t any tough competition then, there was certainly dearth of several marketing tools. Thankfully, businesses today have more opportunities to market themselves better. If you are also an aspiring entrepreneur, aiming to propel your business to new heights, you can take advantage of various affordable marketing techniques available for you. Obviously, to have an elite reputation you have to establish credibility to let your audience speak in your favor. Once your service or product has established credibility within the market place you should attempt to become the authoritative figure by utilizing Social media. The greatest advantage of social networking websites is that it helps you reach a wider audience globally and enables you to establish interpersonal relations with ease. Interpersonal communication is the basic funda of these sites which is why you find millions of users hooked on them. They streamline the communication process and help users get recommendations for services. All you are required to do is, evaluate the right social media channels for yourself and build an effective strategy to benefit from the strengths of each. And unlike releasing news about your company, the buzz is created with the aid of videos, images, infographics, and other interactive activities. There are some factors that you should keep in mind when shortlisting the right social media marketing company for your business. As they say, face speaks a lot. Assessing the market reputation of the shortlisted company is a must. 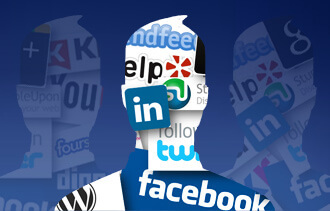 Social media is still a very new platform, finding an experienced company is quite difficult. Read the testimonials, case studies (if any), research online and offline to look for the right service provider for your business. As technology is growing and the number of marketing channels are increasing; ensure that you look for an agency that can offer something new, innovative and attractive. Just the way creative and out-of-the-box ideas excite you, it can catch the attention of your audience as well. For example: – if you sell baby products, you can launch a digital campaign wherein you can target different social marketing channels. You can float the pictures and videos of your products on Pinterest, reach out to the mothers and expected ladies through social forums and arouse their active participation there. Well, strategy is made in accordance to the kind of social media channels you are using, type of campaign you are running, objective of running a particular campaign, your business, etc. Each industry is better utilized on different social platforms. For interest if a majority of your customer base is “woman” then your time is better spent on PinInterest vs. Twitter. Though these are not the only considerations to help you choose the right Online Marketing Agency, we tried to raise some of the most essential points here.